Even when on a story time roll it is very rare for Coryn to ask to re-read a book the moment we reach the last page. When she asks for a book to be read to her three times in a row you can put the book in a very special category. 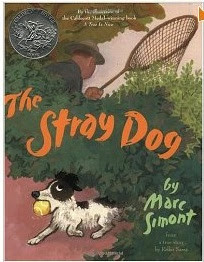 This library trip we found a very special book called "The Stray Dog." Most of its popularity is probably due to the fact that Coryn would really like a puppy so this story where a stray dog approaches a family on their picnic is her ultimate fantasy. The text is sparse (some pages have no words at all, just narrative advancing pictures), but the illustrations tell most of the story and you can point out things as they happen in your own words. Coryn especially loves the pictures of the dog park and will point out every dog to me and ask questions about them. We may not be able to own a real dog any time soon, but The Stray Dog will be a favorite around our apartment for awhile to come.